Liberty Hauling Services is a simple phone call away when you’re ready to declutter your home or business. There’s not a more cost-effective or efficient way to get rid of accumulating junk than renting a roll-off dumpster and clearing it all out at once. We possess the equipment, trucks, manpower and experience to complete your junk removal in Oviedo, Orlando and surrounding cities. 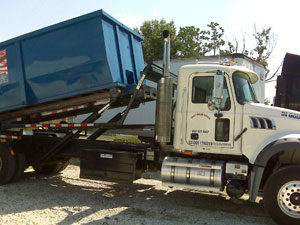 Liberty Hauling is an experienced dumpster company having worked in the industry for more than 35 years. We’re a faith-based, locally-owned company committed to providing an honest service and fair pricing. We’ll meet, and even exceed, your expectations! We’re a proud member of the Oviedo Winter Springs Chamber of Commerce, and we work hard to strengthen our communities through responsible waste disposal practices. With Liberty Hauling Services, you can expect competitive rates, responsive same-day service, and satisfaction is guaranteed! Don’t take on a junk removal project without the help of Liberty Hauling! You will find that our service is above and beyond the normal standards. We are fully licensed and insured and offer the best service along with best prices. We know our teamwork enables us to serve our customers better and faster. Call for a quote on your next project and start getting the respect and quality service you deserve today. Liberty Hauling is a key asset for the Orlando-area residential and commercial junk hauling market. We currently carry a large inventory of 10, 20 and 30 cubic yard roll-off containers. We can accommodate your needs whether you need a single dumpster, multiple dumpsters, container swap-outs, live-loading situations and more! Our goal is to ensure the customer is satisfied with our services. Depending upon the scale of your junk removal project, our friendly staff can recommend the ideal container size for the job. It can sometimes be difficult estimating the amount of junk you are disposing of, and that’s where we can help. We have more than four decades of combined industry experience. A standard kitchen stove/range measures approximately 3 ft. x 3 ft. x 3 ft., which is equivalent to 1 cubic yard. Use this as a measuring stick to estimate how much dumpster you’ll need. For example, if your junk pile takes up roughly the same amount of space as about five kitchen stoves, you know that you’ll need about 5 cubic yards of volume to dispose of it – you’d probably be okay in choosing a 10 cubic yard bin in this case. However, this is a rough estimate and not always 100% accurate. This is why it’s a good idea to go with a bigger dumpster if you’re on the fence about whether or not the junk or debris will fit. Going with the smaller container could lead to overage fees for exceeding the weight allowance, or it may require that you order a second dumpster to finish the cleanup. Play it safe and choose a large dumpster. Bulky items, such as furniture, take up a lot of volume inside a roll-off dumpster. This makes it difficult to judge which dumpster size will accommodate it. It’s generally a good idea to choose a larger 20 or 30 cubic yard dumpster for furniture removal where larger pieces (e.g., sofas) are to be disposed of. If in doubt, we’d be happy to discuss your project and recommend a roll-off container for you. Our service area covers all of Central Florida, including Orlando, Oviedo and neighboring areas. We provide free dumpster quotes, and our pricing is all-inclusive, meaning dump fees, delivery/pickup, and labor is included in the quote. We provide discounts to the military and senior citizens. Call for details! Call (407) 977-4187 to get started on your junk removal project today!